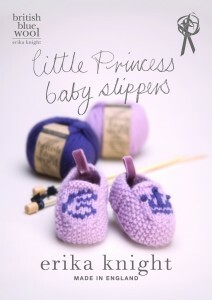 Great Ormond Street Hospital have asked us for some babies booties. That’s one of the things that we just don’t have in stock so we need you to get knitting. These ones are knitted in British yarn from the finest fleece in the land, the Bluefaced Leicester and aptly called British Blue, the newest yarn in the erika knight yarn collection. Knitted in st st and moss st, and embellished by way of Swiss darning with a ‘crown’ with french knots and an initial of your choice. 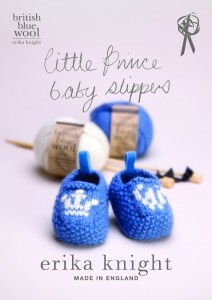 The knitter is invited to the erika knight website to download a free alphabet and technique guide to personalise their slippers for their own little ‘Royal’. If you knit a pair for yourself or for a gift, please make a pair for us too and we’ll make sure they get delivered to a good home. Check out their website to find stockists of the lovely Erika Knight yarns. The colour range is so delicious you’ll want all of them.